Jan Zwicky and Robert Bringhurstcomposed new poetry for a week-long series of performances of Joseph Haydn’s “Seven Last Words” for string quartet, collaborating with a quartet from Early Music Vancouver that included Marc Destrubé and Linda Melsted on violins, Stephen Creswell on viola and Tanya Tomkins on cello. The last concert of the series took place on January 24, 2015, in Pyatt Hall in the Orpheum Annex in downtown Vancouver, with the space arranged as a café with candlelit tables, setting a mood of intimate intensity. Performing Haydn’s Op. 51 presents some unique challenges, not the least of which is what to do with what Bringhurst and Zwicky call in their programme notes “the presence of a text” in a work “designed as a magnificent musical envelope with seven pockets for spoken words.” The seven “words” are “seven short phrases from the Latin bible” that register in the rhythms and phrasings of musical lines, and it’s tempting to hear a form of textual mimesis in Haydn’s music, not unlike (for example) the fourth section of John Coltrane’s A Love Supreme, in which a “psalm” is delivered as a verbal recitation in the lead melody: “the musical phrases,” Zwicky and Bringhurst note, “rise from the meaning and shape of the text.” This noetic melopoeia seems to be what draws Bringhurst’s ear, in particular, to this work; his poetry recurrently pursues what he has called “the musical density of being.” I’m not sure that Haydn’s classicism would effect quite as much pull, although its measured textures mesh well with the chiseled exactitude of Bringhurst’s sense of line. Zwicky, too, shapes lyrical meshes of the musical and the philosophical in her poetry, and she has mined both Classical and Romantic European musical history for source material for her work. After all these experiments, and in the face of Haydn’s own wordless eloquence, could there still be something to say? One reason to think there might be is, of course, that the crucifixion has never ceased. Man’s deliberate and vengeful inhumanity to man – and to just about everything else – is no less vivid and casual in the twenty-first century than in the first. So in 2014, when we were invited to supply some words for a performance of Opus 51 by Early Music Vancouver, we said yes. And our theme became what we thought it had to be in our time: the crucifixion of the earth. there is no one to listen. The kind of listening Bringhurst both calls for and wants to enact in his work refuses the “mere pleasure” of distraction and pushes instead toward the excoriation and even the extinction of the callous “inhumanity” of the human, an audibility that demands that “no one” be listening, not in the service of nihilism but rather of the dissolution of our domineering egocentrisms. Zwicky can sound, at times, less confrontational, but she is no less exacting in her demand that, as Rilke famous has it, we change our lives: “Learn stillness,” she writes, “if you would run clear.” The clarity of style and the communicative immediacy that she wants in her poetry incline toward just such an attentive stillness, an extinguishing of our all-too-human desires for control and agency: a relinquishing. (Again, my line breaks – not necessarily Zwicky’s.) That recognition, if only a prayerful gesture toward the relinquishment of shared self, a selflessness we might share at the limits of words, opened into a passionate musical response from the quartet, as the potentially cold edges of Haydn’s calculated classicism evolved into what felt to me almost Steve Reich-likerhythmic loops and cascades: a present-tense music that wanted to open our ears, collectively in that space and that moment, to hope and to possibility. I have it from a reliable source that at one point during his speech at the ACRL conference in Indianapolis this past March, Henry Rollins re-emphasized the significant impact on his life of the music of The Clash and of the music of John Coltrane. The latter might be a bit surprising, although Rollins did record Everythingwith Charles Gayleand Rashied Ali in 1996, so Coltrane has been with him all along. He has said that he first heard Coltrane from records his mother owned, but that what he took from Coltrane’s music wasn’t spiritual or even musical, but a kind of directness, a fierce honesty that models intense communication: “I am not a musician. I have written a lot of songs but it’s just to get the words out. I always admired Coltrane for his truth and his purity. He was really going for something. He is inspiring because you can tell every moment he plays is sincere. I have never heard anything like it.” (The same thing might even be said for Joe Strummer’s gruff, insistent, committed vocals.) As far as my own listening goes, I think I have been struggling (or maybe something less agonistic: aspiring) to reconcile the collisions of Coltrane and The Clash, conflicted aesthetics aimed at what I tend to divide into the transcendent and the world-bound, the excessive and the mundane, contemplative restraint and expressive intensity. One conceptual trajectory that might bridge such bifurcations is the idea, and the practice, of what I’d call commitment. It became a key word in my Embouchureproject, and it makes a kind of sense, for me, to re-invoke it here. One of the reasons I have picked up on what Henry Rollins has to say about Coltrane’s music is that his tastes, his preferences, seem to coincide with my own: he says he is most drawn to late Coltrane, post 1964. And he’s consistently skeptical about any all-too-easy professions of enlightenment or poetic transport: he’s no mystic, but a demystifier. That doesn’t make his work any less searching, any less committed to honest, hard engagement with a will to truth, to truthfulness. But it does depend on how you understand what and when and how that truth might be. 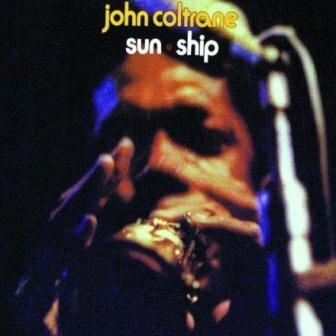 The recent release of the “complete” studio recordings for John Coltrane’s Sun Ship – first issued in edited form posthumously, in 1971 – aims materially toward full disclosure of historical and music fact, to paint a vivid, truthful sound-picture of the improvisatory collective creative process of the Coltrane-Tyner-Garrison-Jones quartet by offering for public issue every listenable scrap of music and studio chatter extant on tape. This is definitely a music of plenitudes: the huge swathes of saxophone, the dense piano, the rolling bass-lines and the surging drums characteristic of the quartet’s last days together, and of the music Coltrane made from 1964 until his death in 1967. The session that produces Sun Ship takes place on 28 August 1965, and, apart from a first pass at the “Meditations” suite on September 2 (issued later as First Meditations), this is the last time the “classic” Coltrane quartet will record together as a unit. (McCoy Tyner and Elvin Jones will leave in November, replaced by Alice Coltrane and Rashied Ali: all of this information is well-known, and well-circulated.) So in so many respects, this music has immense historical value and interest, and every detail is worth hearing. Even the fragments and outtakes can be heard as stunning performances unto themselves. The false starts and apparent missteps overflow with powerful, potent music. Everything happens. It’s tempting to want to hear what Walter Benjamin might have called a messianic totality in these recordings, a vital archival gathering of historical minutiae – the digital imprint of every essential sonic particle – into an absolute and audible present. We can imagine ourselves there, as we listen – or can imagine the “there” of those searching performances now here, relocated in our own immediate moments. That’s how recording works, sure, but the idea of a “complete” package such as this one is to seem to place us, aurally, in close proximity to the music’s realization. And it works, of course: McCoy Tyner’s solos on both versions of “Sun Ship” are astounding instances of extemporaneous dynamism, but more than that they refuse to settle even on repeated listenings, re-creating the sound of surprise – at each return, they still never sound the same, even though they must be. Historical value collapses into what feels like an exploratory, unsettled present tense. Hearing Jimmy Garrison patiently evolve and re-shape his solo prelude to “Ascent” reaffirms his careful attention to depth of tone, to the rounded resonances of his instrument; in his ensemble work, too, I can hear foreshadows of William Parker’s elastic sense of time and line (in his recordings with David S. Ware or his In Order to Survive quartet). But that influence also seems to dissolve in the palpable immediacy of Garrison’s playing. What strikes me most about this session both works against and strangely reinforces this idea of a reanimated plenitude, of a musical Jetztzeit. A little of the studio banter was included in the original release of Sun Ship, but now most tracks contain extended snippets of “studio conversation”; rather than mar the music in any way – they don’t, of course – and rather than merely let us hear bits of the musicians’ speaking voices, as if they are with us again in our own sound-spaces, the loose fragments of casual chatter present a stark contrast to the intensities of the performances. The quartet can shift on a dime from chuckling about a track title to overwhelmingly powerful improvisation. How is it, I keep asking myself, that a music of such depth and wonder can co-exist so unproblematically with the casual and the mundane? Though maybe, maybe, that seemingly effortless coexistence is exactly what this music can teach us, can let us overhear. Freedom in the Air is a powerful suite for quartet, improvised to accompany a projection of iconic, historic photographs (by James Karales and others) of events in the American Civil Rights movement. A group led by trumpeter Barry Long, and including saxophonist David Pope, bassist Joshua Davis and percussionist Phil Haynes, performed the music at the Campus Theatre of Bucknell University in Lewisburg, Pennsylvania, on 23 February 2012; the performance was recorded on video, which can be viewed online through the university’s website. The compact disc or download is available for purchase from bandcamp.com. It’s a great recording, well worth buying. The music is ekphrastic; sounds are keyed to visuals, sometimes providing auditory allegories – as in the fifth section, “Fifteen Minutes in Birmingham,” when the racial violence depicted in the photographs draws discordant, harsh responses from the players – but more often acting as reactive contemplation, a kind of aural commentary. For musical source material, Long draws on spirituals and protest songs, many of them from African-American religious and social traditions from the southern states, many of them performed by participants in the marches and protests to which the images bear historical witness. (Two pieces come from elsewhere than the American public domain, but both are deeply enmeshed in the civil rights soundscape: John Coltrane’s “Reverend King” – posthumously issued on his album Cosmic Music – and the song that provides the suite’s title, “Freedom in the Air” by Bernice Johnson Reagon.) Watching the video, you can see how attentive to and how focused on these images the members of the quartet remain, throughout the performance. The photos act not so much as score but as timbral palette, setting the tone. Without the visuals, the music still works incredibly well, but as a meditative rather than a contemplative tone-poem. Things open with Long solo on flugelhorn, intoning Reagon’s melody as an autumnal taps, framing what follows from the quartet in a largely elegiac register. The music on the whole is consistently measured and self-aware, rarely venturing beyond a medium tempo, but it’s also deeply evocative, entrancing, awash in genuine pathos. I have been trying for a few days to think of an analogue for this group’s sound, and the closest I can come is, perhaps, Paul Motian’s trios with Charles Brackeen (whose firm, deliberate tenor saxophone tone David Pope sometimes seems to echo). Phil Haynes’s drumming can occasionally be subtly unruly, gently but firmly disrupting easy agreements. Collectively, the quartet tends to refuse sentimentality or nostalgia in favour of a lyrically incisive and open-eared historicism, giving difficult episodes in a shared national past a present-tense relevance, a contemporaneity. Improvisation creates a set of contingent segues between what’s been done and what still happens, and invites us to consider, to reconsider, how negotiating these cultural challenges can vitally matter to us even now, especially now. The manoeuvres between the contemplative and the meditative, between the reactive and the expressive, that this performance undertakes can be better addressed, I think, by looking at the video, and paying attention to the intensity of the musicians’ focus – how they themselves look at the on-screen images. Three of the four members of the quartet are academics, and two hold doctorates: I mention this fact to suggest that, if this music is to be understood as scholarship, there is no sense of clinical detachment or analytic objectivity here. The historical engagements they undertake are, instead, consistently creative, vital and moving. It’s also worth noting – although it’s a bit presumptuous on my part – that none of the musicians appears to have a visibly African-American heritage; given that they are playing through such thoroughly racially-inflected terrain, they might tend to be positioned as outsiders or onlookers. But Long’s point in presenting this music, I’d say, is to suggest that we are all – regardless of where we might think we come from or how we look – implicated in this cultural history, and that we need not only to be self-aware of that enmeshment, but also to actively negotiate our social subjectivities, building communities not necessarily through unproblematic identifications – such as similarities of appearance or background – but through our encounters with difference, with our own inherent differences. Barry Long’s music makes one such set of encounters sing. The video ends with a minute-long spontaneous silence that the CD can’t include, but it’s also one of the most powerful musical moments in the performance: a space of thoughtful, respectful exchange onto which this fleetingly profound music opens, helps us open. Here is the principal part of the text of a fifteen-minute conference paper I delivered in September 2007 at the University of Guelph, speaking at the colloquium of the Guelph Jazz Festival, entitled that year “People Get Ready,” and focused on the community-building and political engagements of improvised musics. Fred Ho wants a music that speaks, and he wants to speak through music: “The music,” he writes, meaning for the most part jazz-derived improvisation, “has to and will embody messages, either explicitly (in the form of lyrics and/or song titles) or implicitly (in the sound and in its spirit).” To start out, I think, there are at least two things to note in such claims, of which Ho makes many. The foremost is almost unremarkable for its transparency, as it’s probably intended to be: Ho writes and speaks about improvised music as much as he composes and performs. The series of manifestoes, polemics and mandates that he has delivered, in essays and addresses over the last two decades, are instances of musical embodiment, not just statements about what he thinks his music does, but language forms representing the state to which his own music aspires: it wants to say what it means, directly and transparently, to its audience, “the people.” Second is a stylistic and grammatical point, really, a feature of his characteristic language that tends to be read back, by listeners of various persuasions, onto his music, often as stridency or brashness: Ho’s language, if we mean to treat it as in any way poetically shaped, is inevitably cast in an imperative mood. My question today, which I want more to pose than pretend definitively to answer, is how concretely music works toward what we might take for meaning. 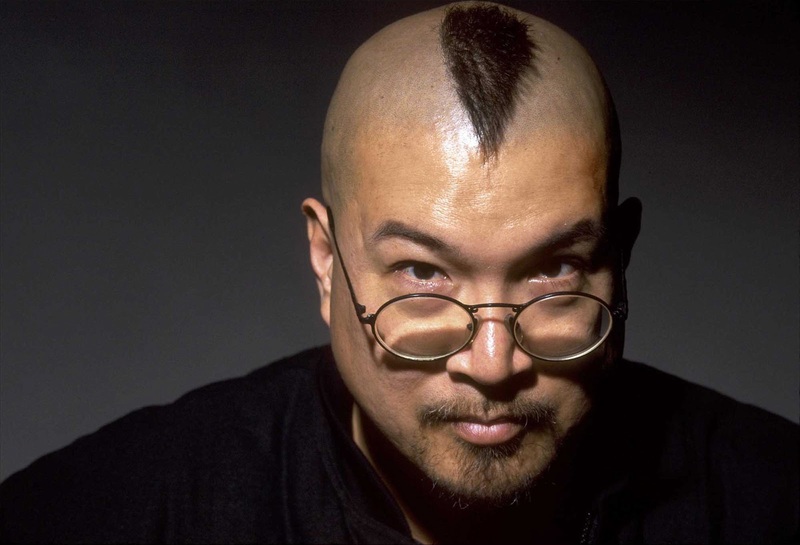 I want to take Fred Ho at his word. Can a baritone saxophone solo, for example, of the sort you’re hearing now, be said to speak? [Fred Ho’s arrangement of “Naima” was playing in the background, as I presented.] How does music aspire, beyond obvious programmatics, to the condition of speech? What exactly is being declared? There are many musicians through­out jazz history who have been labeled revolutionaries, but that’s usually because of their musical accomplishments. Fred is a revolutionary who uses jazz as his medium. The presumption, coming out of Ho’s work as much as Shoemaker’s well-attuned audition, is that sound can carry political and social meaning directly, formally; that revolution isn’t a trope but an aesthetic practice, enacted both for and with audiences. Ho describes the reaction he wants from listeners as akin to those of a child, who can “be both spellbound and revolutionized” by a given performance; music at once enthralls and enables, two countervaling states of raised consciousness – piety and critique, mimetic wonder and diegetic detachment, in a sense – that inhere in his populist claims. To play for the people, if you think about it, is both to invite mimicry and to call for unruliness, to refuse that same invitation. How, if music means to speak, can “people” be empowered by the cultish image of the inspired soloist, by his polemic force, exactly to speak out, not to be silenced by the verbal or expressive force of that declaration? There’s a deeply embedded formal contradiction here that speaks to the nature of a musical politics, and to the ways in which music operates, I think, as a cultural pedagogy, as instruction in democratic or revolutionary forms of critique. In a talk at the triennial conference of ACLALS on 19 August 2007, Henry Giroux spoke with some dismay about what he called “the politics of disposability” among American young people, calling for a renewed and hopeful cultural pedagogy, following Paolo Freire, a radical futurity that dignifies people “so that they can become fully free.” This is Fred Ho’s vocabulary. Not only is it necessary to foster critical engagement among students with the cultural materials in which they find themselves immersed, teaching how to “read critically,” but there is a pressing need, Giroux argues, “to prepare students to function as critical agents capable of understanding, engaging, and transforming those discourses and institutional contexts that closed down democratic public life” (119). They need to take part. Despite his deep suspicions of aesthetics, which he suggests is tainted by “the residue of nostalgia and elitism” and also “seems particularly out of date, if not irrelevant” given the pervasiveness of a largely debased popular culture (are there echoes of Adorno here? ), Giroux insisted on moving beyond critical thinking toward enabling students as “cultural producers,” as makers, as co-participants. But what do such arts sound like? Should we still be cautious of aesthetics, given the barometers of taste and technique that tend to manifest in such contexts? How do we face up to the demands of a democratic or popular art, of its audience? We’re negotiating a tension over the declamatory and the formal here: the expressive and the well-made. Addressing the rigour of our engagement depends, if you think about it, on a set of standards against which the openness of that participatory dynamic mitigates. Still, when Ho asks, in a recent artist’s statement, “how does music free us?” he draws attention to sonic texture and to poetic structure as inherently, crucially political, focusing our ears on how that challenge occurs, physiologically and consciously, rather than simply what it might be about. Ho’s apparently naïve preference for uninterrogated declamation – what some critics have dismissed as crude stridency – actually involves him, along with his listeners, in a difficult dialectic, a deeply rooted tension over the nature and practice of expression itself: of the interconnections between doing and saying. Paul Gilroy’s discussion of jazz and diaspora in Against Race – where he argues for “new possibilities and new pleasures” enabled by the fundamental dislocations of diasporic non-identities – provides a starting point for re-thinking Ho’s indebtedness to racial nationalisms, and for a more careful and attentive reading of his mesh of sounds and words. Coming to Gilroy might seem problematic in this context, given Ho’s overt attachment to what Gilroy dismisses as raciology, but Ho’s frequently discussed but still largely uninterrogated adherence to black nationalism – particularly as a non African American – finds one of its moments of coherence in the context of diaspora. How can a Chinese-American seriously compose a Black Panther suite, for example? There’s no reason why he shouldn’t of course, but the racial politics explicit in this work certainly trouble that allegiance, although trouble is exactly, I think, what Fred Ho might be about. This is a serious issue for a version of what I’ve heard here start to be called social aesthetics, I think: how effective to locate and to speak to a popular audience. Ho’s recording of John Coltrane’s “Naima” (1998) – with lyrics by poet and journalist Andrea M. Lockett – offers listeners an opportunity to address Ho’s deliberately conflicted relationship to the radical sixties, and also suggests how a dynamic critical relationship between Ho’s work and his multiple cultural and musical heritages – what he names a practice of radical respect – has the potential to enact a model for new and liberated human communities, an arduous and challenging idealism he calls, following Sun Ra, embracing the impossible. 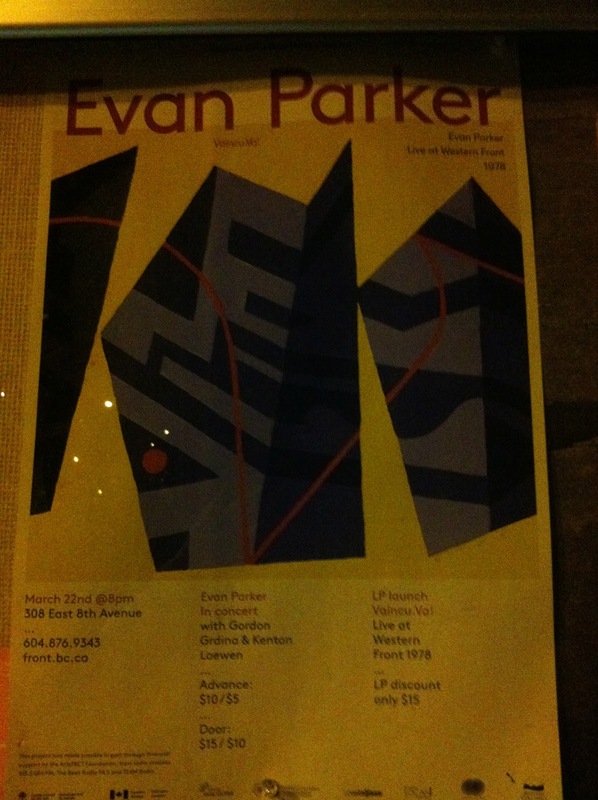 It was a privilege to hear Evan Parker play last night, Friday March 22nd, at The Western Front. The concert was a return to a venue that has become a Vancouver landmark for the avant garde, presenting cutting-edge music, dance, film and visual art for 40 years. It also marked the release of Vaincu.Va!, an LP version of a recording from The Western Front’s archives of Evan Parker’s first solo concert there on November 8, 1978, which was the last performance in his North American tour that year, a tour that Alexander Varty credits as “the first of its kind to be undertaken by a European improviser, paving the way for an invasion of exciting new music.” In the unfolding of this music, its trans-Atlantic dissemination, last night’s concert was a significant moment, reinvigorating an important improvisational archive, making a history happen. Again. Evan Parker played two sets, each under three-quarters of an hour: one, an extended solo improvisation on soprano saxophone (echoing the 1978 concert), and the other in an improvising trio with Gordon Grdinaon electric guitar and oud and Kenton Loewen on the drumkit. The Front’s recently refurbished Grand Luxe hall, upstairs, was packed to capacity; there must have been close to 150 people in the palpably supportive and expectant audience, a mixture of neophyte listeners for whom this would be a first experience with Parker’s music live and others who had been following Parker’s music for decades, some of whom I even overheard saying that they had attended the first concert there 35 years ago. I felt a very real sense of a listening community, not only because I was able to reconnect with friends I’d first encountered years ago at events like this, a fairly dedicated long-standing following for improvised music in Vancouver, but also because, before the concert and at the set-break, people seemed genuinely keen to talk with each other, not just about the music they were hearing, but about themselves; it seemed to me that, whatever the aesthetic gifts and challenges that this particular music offered us, it also occasioned a sense of bonding, a coming together, however briefly, of good shared human energy. The solo soprano set was a single continuous piece that was sui generis for Parker. “Well,” I think I heard him say quietly before he began, “here we go.” Hearing his solo soprano music feels to me like stepping into a thick stream of layered arpeggios, intersecting torrents of 32ndnotes and harmonics that Parker sustains without pause through circular breathing for half an hour or so, at which point he stops; when he plays he doesn’t produce a finished work so much as enter into an ongoing process, a rivulet of shared aural time. The rapid shifting among at least three registers on his horn produce a kind of counterpoint not unlike the compositional practices of Steve Reich (who, like Parker, acknowledges John Coltrane as an early influence), but where Reich’s music seems marked (and this is not a criticism, but an observation) by sculptural calculation, Parker’s polylinear music seems to me not so much an effect of abandon or looseness, but more accommodating than Reich’s to the unpredictabilities and small excesses, the momentary remainders and overflows, of body and breath. I could hear, I could fell the fleeting intensities of those cascading lines resonate and pulse in my ear canals. Resonance: that’s exactly the right term, I think, for what Parker’s solo music seeks, and moment by moment what it finds. He stopped playing as unceremoniously as he had begun, just taking the horn out of his mouth (as Miles Davis had told Coltrane to do back in the heyday), and was met with huge applause for that small room. I have never attended an Evan Parker performance that was less than great, but this short improvisation felt tremendous. He returned to the centre of the stand for what seemed like an encore, but instead of more, he played a 20-second head of a Thelonious Monk tune – I’m not sure what it was, maybe “Ugly Beauty,” though I’m sure that’s wrong – during which his tone shifted markedly, more rounded and plainspoken; he was hearkening back, if only for only a passing instant, to Steve Lacy. At the set break, James Coverdale (I was sitting beside him and Lynn Buhler) said he thought of Lacy too, and that it was something like an invocation to Lacy’s spirit, Lacy who has played the same room so many times, solo and in duo with Irene Aebi and others, in the past. Again, he had sounded an improvisational historicity, in the present, in our presence. 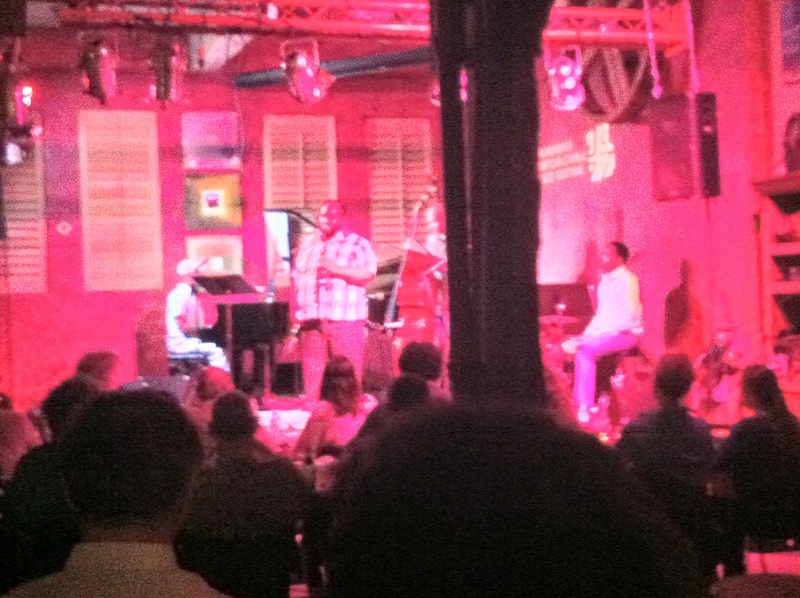 The second set consisted of two improvised pieces by the trio. For the first, Grdina on hollow-bodied electric guitar sometimes traded flexible lines with Parker, now on tenor saxophone, and sometimes provided resonant string texture; his tone, I thought, was sometimes reminiscent of Joe Morris, although his melodic and harmonic conception was certainly all his own. Kenton Lowen’s percussion – speaking of echoes and allusions – recalled for me the multi-directional playing of Sunny Murray (as on his sixties recordings with Cecil Taylor or Albert Ayler). Loewen started the second piece with sparse bowed metals (although I was back in the audience and couldn’t actually see what he was doing with his hands). Grdina switched to oud, and the idiomatic character of the instrument seemed to affect the playing; Parker offered what I think were largely Phrygian lines, a sort of Spanish-Moroccan tinge: lovely, moving, instantaneous world-music. There was no encore. When I was a first-year undergraduate at Western, I didn’t have many friends and I didn’t really try all that hard to make any. I spent much of my time between classes the same way I spent my evenings at home, sitting at a stereo with a pair of headphones on, listening to music. The university’s music library had maybe twenty listening carrels, surrounded by shelf loads of records, mostly classical, but there were no restrictions preventing non-music students from using the collection, so when I had a free hour I would walk down the snow-covered hill from the arts building to the music faculty, and sit through a couple sides of whatever interesting lps I could find. It was here that I first heard the great Bill Evans Trio (with Scott LaFaro and Paul Motian) at the Village Vanguard in 1961; the library owned a twofer compiling most of the tracks (except “Porgy,” I think) from the two albums, and I remember being blown away by the surging, elastic rhythms of their version of “Milestones,” needle again and again. I can’t say how many times over I played the first side of Keith Jarrett’s Köln Concert; those gospel-tinged, life-affirming cadences have been incised into my aural memory, as they have been for so many people – although, for me, those sounds are also marked indelibly by the context of their first hearing, at a turntable in one of those carrels. I also found a copy of John Coltrane’s Live at the Village Vanguard, which I didn’t own at the time, and could give “Chasin’ the Trane” the sustained close attention its deserves. I tried new music – they had a complete set of Stockhausen’s Aus den sieben Tagen – and found some rarities (a great set by Anita Ellis, elegantly accompanied by Ellis Larkins, which I’ve never seen again or since; an amazing Elvin Jones-Richard Davis duo on “Summertime,” which was long out of print at that point, though it’s since been re-issued). There was a pile of Smithsonian recordings of American folk: my ears were opened, my aural horizons maxed. 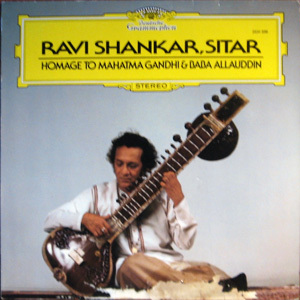 There was one other record I found myself coming back to, a 1981 Deutsche Grammophon release called Homage to Mahatma Gandhi by Ravi Shankar, which combined two side-long sessions with the sitarist and tabla master Alla Rakha. With Ravi Shankar’s death a week or so ago, I started to remember hearing this music, and to think about its impact on me – immature, solitary, arty – a quarter of a century ago. I came to this music via my enthusiasm for Coltrane’s “India,” a sort of minor-modal adaptation to Western ears of Indian idioms. I knew and I know next to nothing about the technicalities of form and structure in Indian classical music, but I do know something about what I thought I heard and can still hear in Ravi Shankar’s recording. He apparently composed Rāga Mohan Kauns, the four-part raga that takes up the first side, extemporaneously and live, at the request of a radio producer in Bombay in 1948, a handful of days after the assassination of Mahatma Gandhi. (The note-sequence that acts as a modal basis for the raga, Ga Ni Dha, is based on Gandhi’s name, a musical code from which Shankar’s extended improvisations gradually take flight.) The first section of the raga is an alap, a slowly building encounter with the basic melodic materials for the piece in non-metered time, without percussion. What I take away from Shankar’s recorded performance – with its tensile, wobbling tones, his languorously whelming, softly metallic attack coupled to a strangely inverted and resilient decay – is a stretching and even a suspension of time. In the encounter with mortality, in a public act of musical mourning, of grief, Ravi Shankar finds for me a pathos, a held poignancy that recalls both the resistance to and the inevitability of death. Rhythm, as he feels his way fingertip by fingertip into his notes, emerges not as virtuosic dominion but as a vibrant elasticity, an opening of the self that bears tactile witness to its calmly passionate refusal of extinction.